I had a hate/hate relationship with my scale. Prior to receiving this new one to review, I had a digital scale that was so fickle. It was always starting out at 4.4 pounds, not adjusting to being placed on its side, and it had fluctuations of 2 pounds or more within minutes of weighing my self a few times. When you are a larger person, 2 pounds night not seem like a deal-breaker. 2-3 pounds on my frame, however, is a sign that I'm gaining or losing too quickly, or that something else may be wrong. 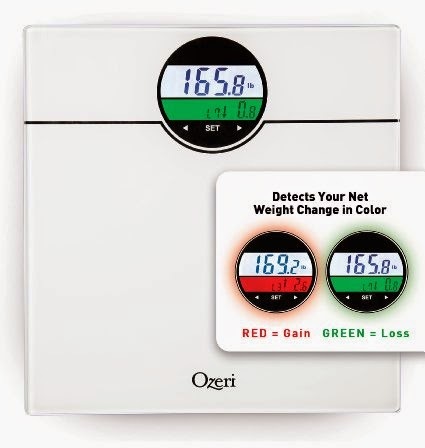 When I received the Ozeri WeightMaster 400 lbs Digital Bath Scale with BMI and Weight Differential Detection, I was happy to see it was thin and very low-profile. It was glass, but I didn't worry about it breaking, as it really seemed be sturdy. I took a moment to read the manual that came with it, as there were a few steps to setting it up for getting the most use out of it. While I am not a total believer in the value of BMI (I'm nursing, so BMI is always a bit skewed), I do think it's a great idea to track weight gain or loss -- especially over a period of time. This scale not only tells you your weight change from day to day (shown as either a red or green light against your net change in pounds), it also shows a total over the last 3, and the last 7 days, as well. So, while you may have gained weight after a bit birthday party from earlier in the day, you can see if you lost or gained compared to a week ago, which may be a more accurate picture of how you are doing. While I rarely have to change scale batteries, the auto power-off function is very fast on this scale. I'm certain the batteries should last a long while. You can find this scale for purchase at Amazon.com.